Bologna attraction-guides.com - Bologna, Italy attractions guide Bologna Palazzo Comunale (Comunale Palace), art, paintings information about attractions, Collezioni Comunali d'Arte (Communal Collection of Fine Arts), Museo di Giorgio Morandi (Museum of Giorgio Morandi), Renaissance paintings and sculptures, open hours, admission charges, location and address, tel / telephone number, general tourist information about Comunale Palace in Bologna area, Italy (Italia) IT - Last updated 30/10/2012. 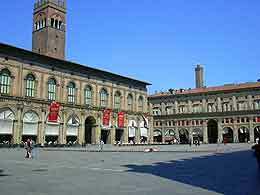 The Palazzo Comunale is Bologna's town hall and houses an impressive collection of Renaissance paintings and other works of art, historic sculptures and also antique furniture. Dating back to the 14th-century, Bologna's Palazzo Comunale (Comunale Palace) is home to the Collezioni Comunali d'Arte (Communal Collection of Fine Arts) and the Museo di Giorgio Morandi (Museum of Giorgio Morandi). Containing many extremely important paintings, including landscapes and still life, Bologna's Palazzo Comunale (Comunale Palace) has been well restored and retains much of its original charm. Located on the western side of Bologna, notable features at the Palazzo Comunale (Comunale Palace) include the enormous central staircase, which was actually designed to be used by horse drawn carriages.